The Occupy Toronto encampment comes to a peaceful end with protesters vacating the last occupied tent in St. James Park after a negotiated settlement with police. The Occupy Toronto encampment has come to a peaceful end with protesters vacating the last occupied tent in St. James Park after a negotiated settlement with police. 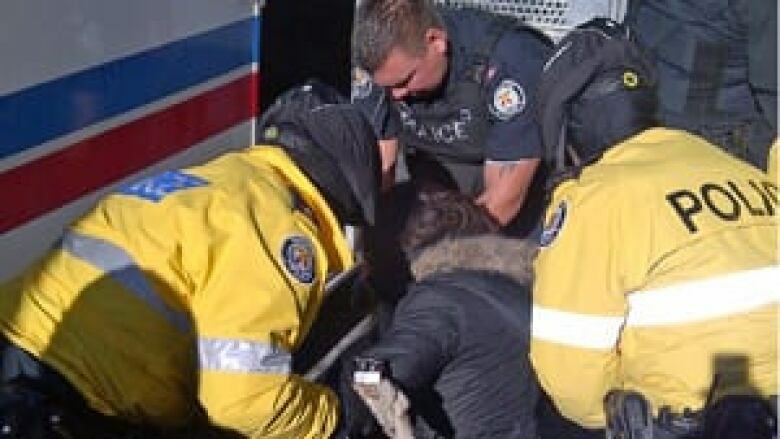 Mayor Rob Ford said in a late afternoon news conference that he was proud of city staff and police for the job they did in the park on Wednesday, and warned protesters they would not be able to relocate. "The protest is over and I'd like to keep it that way," he said. "And if they do go to another park, we will ask them to leave immediately." That could mean another showdown with protesters. Interviewed by CBC News on Wednesday morning, Misha Saunders said he and fellow Occupy protesters were weighing whether to move their encampment to another public space downtown. He said the presence of a protesters' "village" is essential to the Occupy movement. "It's been a hub of activity for people who have a deep-rooted feeling that something must change," he said. "That conversation is going to go to the living rooms, the coffee shops and the subways about how we will move forward in a meaningful way." As the downtown site was cleared, a handful of demonstrators tried to set up tents on grounds north of the Ontario legislature but police intervened quickly. Police began dismantling the last of two yurts (large tents) in St. James Park just after 1 p.m. ET, a move that spelled the end of the encampment that began on Oct. 15. Eleven people were arrested on Wednesday, but there were no violent clashes. Most were fined $75 for trespassing and released. The camp's final day began in the early-morning hours when more than 100 police arrived. Officers re-issued eviction notices and began removing tents on the fringes of the park. City manager Joe Pennachetti said about 100 city staff and 30 city vehicles were part of the operation. Tents continued to come down throughout the morning and it appeared a handful of protesters — some of whom had chained themselves inside one of the yurts being used as a library — would leave only by force. They eventually left after police agreed to preserve the books inside the yurt library. One woman was arrested earlier in the day after police claimed she was obstructing a city vehicle. She was issued a ticket for trespassing and released shortly after. A few hours later, a woman and a man who refused to leave a structure were taken away as crowds shouted "Shame! Shame!" at the police. Despite a few tense moments, most of the clearing work has gone without incident. The move to evict protesters had been widely expected after Monday's ruling upheld a city bylaw, which effectively deemed that protesters camping overnight were trespassing. Protesters are only allowed in the park between 5:30 a.m. and midnight, and not allowed to bring tents into the public place. Pannachetti said he won't have a sense of damage until after the cleanup of the park, which is at the corner of King Street East and Church Street, and had been filled since mid-October with tents that at one time totalled about 300. City staff have said they need to winterize the park. Coun. Pam McConnell, whose ward includes the park, said the Occupy movement would be contributing $10,000 toward the costs of the cleanup. Any further costs will fall to taxpayers. Pannachetti, who thanked the protesters for their co-operation, said tents were numbered and inventoried so that they can be claimed by their owners. Also, the city made efforts to help anyone at the park who needed shelter or other support and will continue to do so, he said. Business owners in the area were relieved — one arrived in the park with flowers for both the police and the protesters — but some wondered why the city didn't act sooner. "Camping overnight in a public park is illegal," Rachel Young said. "It should have not have continued on past the first night." Deputy Mayor Doug Holyday said the time of the operation was carefully chosen. "The police picked the time past 5:30 a.m. so that anybody in the park is not violating anything by being in the park, but their structures are," he said. "We want to remove their structures and start cleaning up the park. People that are using the park in a reasonable fashion are entitled to be there just like anyone else and they can stay there until midnight." Holyday said the city would have liked to evict the protesters earlier, but couldn't. "There would have been a lot of arrests, I think there would have been probably been a lot of injuries, and I don't think we wanted the bad publicity," he said. Coun. Adam Vaughan, a frequent critic of Ford's, said the mayor deserved a lot of credit "for something which he doesn't show a lot of, which is restraint." The Toronto eviction notice follows similar moves to dismantle Occupy camps in other Canadian cities. In Vancouver, Occupy Vancouver protesters moved their camp to a park in East Vancouver after packing up before a 5 p.m. PT deadline to move off the courthouse grounds at Robson Square. Police in Ottawa evicted about two dozen protesters from an Occupy encampment in Confederation Park early Tuesday. In Edmonton, police appeared at about 11:30 a.m. MT to check on protesters, who said they wouldn't leave. The Occupy movement in Canada was spawned by protesters on Wall Street, although camps around the world have been slowly dismantled by officials. The movement — which held an international day of protest Oct. 15 — generally protests disparity between the rich and poor, although there are no established leaders or concrete demands.